Heavenly voices: Lyrlene Schipplock with Watoto Children’s Choir members Alex, 11, Aggrey, 13, and James. 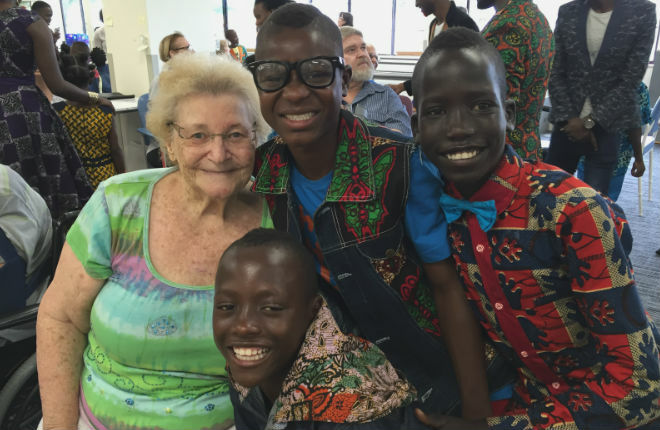 PATIENTS in Mater Private Hospital Brisbane rehabilitation unit were treated to a musical extravaganza with an a cappella performance from Ugandan orphans from the Watoto Children’s Choir on April 12. Each of the children in the choir has suffered the loss of their parents either through war or disease. They live in Watoto children’s villages which have been built to cater for children who have lost their family or are vulnerable for many reasons. Mater Private Hospital Brisbane rehabilitation co-ordinator Deirdre Cooke said the choir was a breath of fresh air for the patients. “We loved the choir visit – their beautiful singing voices and gorgeous smiles were extraordinary,” Ms Cooke said. “I watched the faces of patients and staff alike light up – their joy was obvious. It was also moving to hear the individual stories of the children. Watoto Children’s Choirs have travelled internationally since 1994 as advocates for the estimated 50 million children in Africa, orphaned as a result of HIV/AIDS, war, poverty and disease. The experience gives the children exposure to other cultures, broadening their world view. Musical extravaganza: Pam McAllister meets other members of the choir. It also gives them confidence and boldness and helps them rise up out of their own situations of sadness and despair. 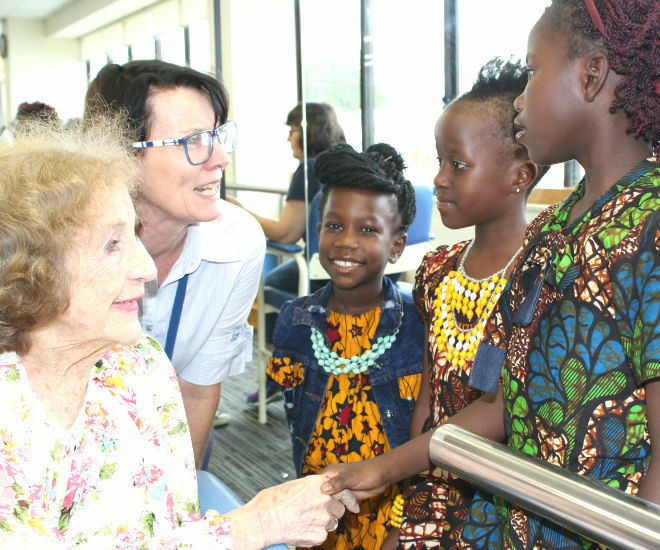 Mater rehabilitation patients have often been in hospital for several weeks, and the joyous performance of the Watoto Children’s Choir lifted their spirits and provided a welcome diversion from their recovery. Mater patient Lyrlene Schipplock enjoyed the performance and loved meeting the choir members. “The choir were just wonderful,” she said. Accompanied by a team of adults, the choir presents Watoto’s vision and mission through their stories, music and dance. The Watoto choirs act as ambassadors to raise awareness about the plight of the orphaned and vulnerable children of Africa.